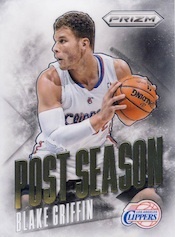 Returning for its sophomore set, 2013-14 Panini Prizm Basketball features the brand's trademark mix of chromium designs, colorful parallels and autographs. Growing from its debut in 2012-13, the growing number of parallels is the biggest change most collectors are bound to notice. 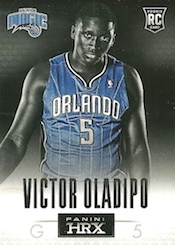 The 2013-14 Panini Prizm Basketball base set is straightforward. The upscale look of the cards is the main selling point, at least for set builders who don't chase sets with autographed rookie cards or high-end short prints. 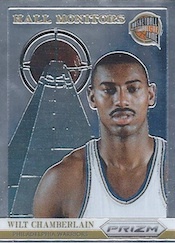 In its short time on the market, Refractor-like Prizm parallels have become the brand's cornerstone. 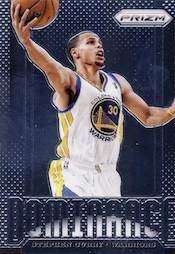 Collectors have lots to choose from in 2013-14 Panini Prizm Basketball including new Die-Cut Purple (#/49), Gold (#/10) and Black (1/1). Different retail spots also have their own exclusive Prizms, such as Green and Blue. Hobby boxes include a pair of autographs. 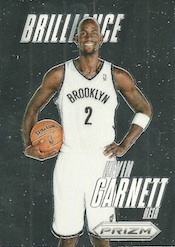 The set also has basic inserts, such as Brilliance and Post Season. 297 cards. Shop for base sets. Click here for a full Prizm parallel break down and visual guide. I loved this product last year! 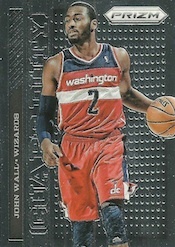 I ended up with a Kyrie Irving Gold Rookie numbered 1/10! Needless to say it was worth a fortune! So I bought some more of these cards this year, and it couldn’t have been a bigger mistake, there are too many different kinds of parallels now making Golds far less valuable. In a matter of a few days the market was flooded with Retail parallels which are nowhere near as rare as last year. This product is taking a nose dive!!! I hope the go back to the old format, Prizm Refractors and autos no Gold Autos, and no black Finites. Also retail should only have green parallels. So so disappointing! I picked up a box of this last night. Pretty good product. 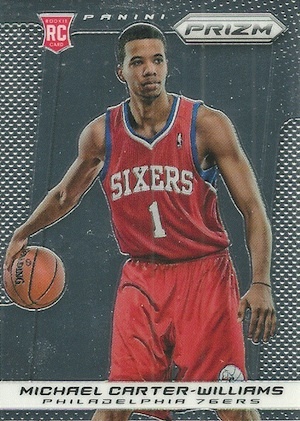 I got more rookie cards than I expected. I will try another box soon and see if my luck continues with it. High quality, beautifully detailed and fingerprint friendly coating makes this product a winner. Parallel overkill, but they must keep up with the competition and industry trends. Huge list of “All-Stars” and Rookies definitely will make this set a real challenge to compile, if that’s your thing! Insert sets are very unique and becoming a secure tradition to collectors, as myself. showing some love for the ex-ABA greats. other basketball vendors like I used to. Loaded with rookies. 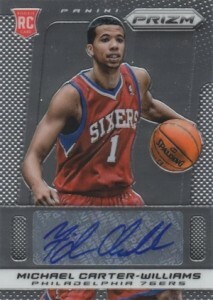 If you like rookie cards, get this. I’m a high fan of the panini prizm line I’ve always been lucky with these boxes and I was able to continue with the basketball boxes. I will buy more great cards.